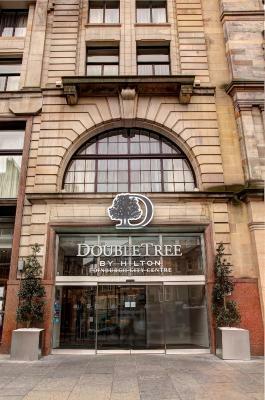 Lock in a great price for Doubletree by Hilton Edinburgh City Centre – rated 8.6 by recent guests! The hotel is in a very convenient location. Spacious and modern room. 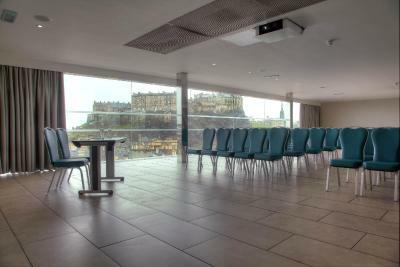 The room was great, the view onto the castle was an added bonus. Amazing hote just behind castle. Bar was great and had lovely atmosphere. Staff were helpful and friendly. We are vegan which means we eat a plant based diet. Usually we don't get many options when eating breakfast in a hotel but this time we had many great options for breakfast. 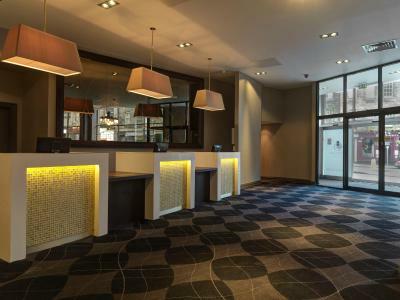 Great location, very clean and comfortable rooms, and friendly staff. An excellent value! The hotel was great. 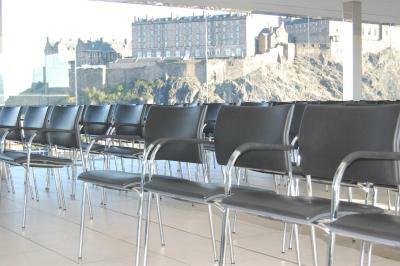 The location in Edinburgh was perfect. 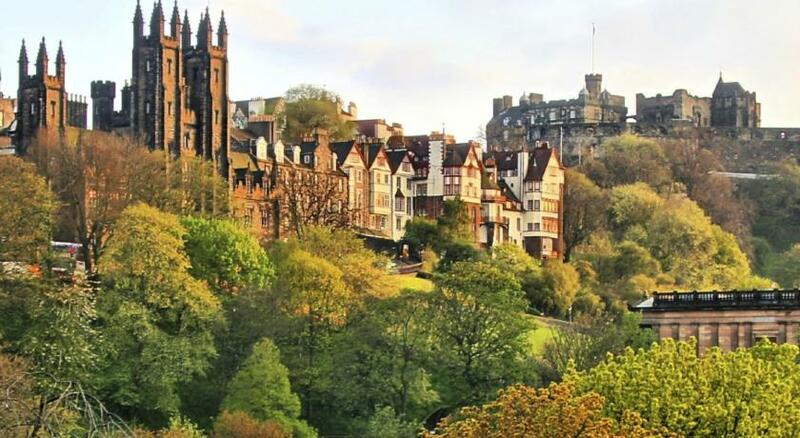 Close to the castle, the royal mile and other attractions. Great location. Front desk staff were very nice, as well as the staff in on site bar. 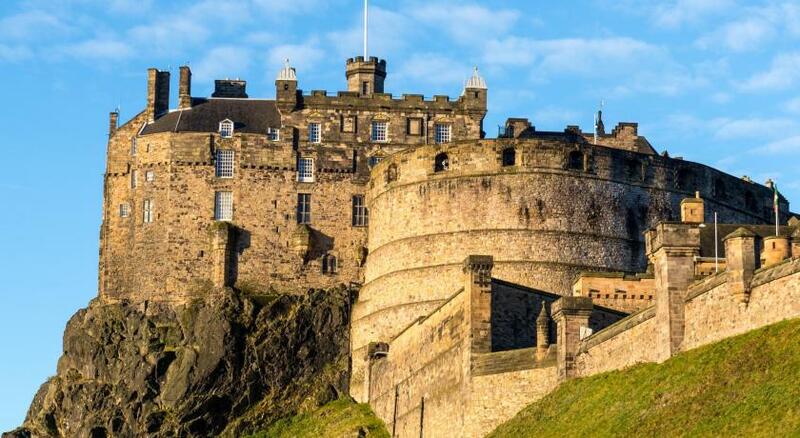 The location and staff were excellent; just a quick walk to the royal mile and castle and the staff were very helpful and knowledgeable on the area. 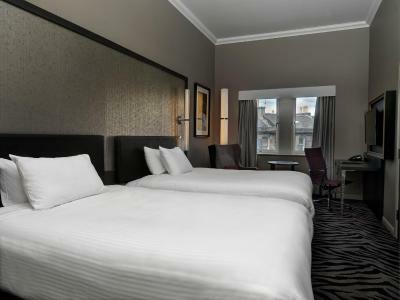 Doubletree by Hilton Edinburgh City Centre This rating is a reflection of how the property compares to the industry standard when it comes to price, facilities and services available. It's based on a self-evaluation by the property. Use this rating to help choose your stay! 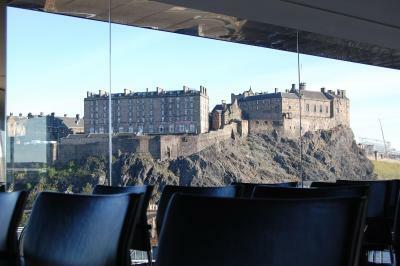 One of our top picks in Edinburgh.In the heart of Edinburgh, the Doubletree by Hilton Edinburgh City Centre offers fantastic views of Edinburgh Castle. 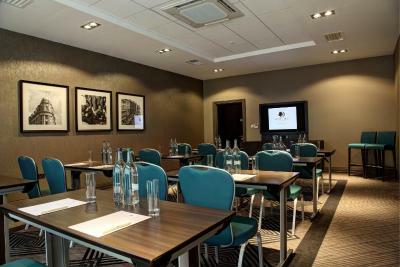 Edinburgh International Conference Centre is just a quarter mile away and free Wi-Fi is provided in public areas of the property. Built in 1892, this beautiful building is only a 10-minute walk from the shops on Princes Street and vibrant local nightlife. 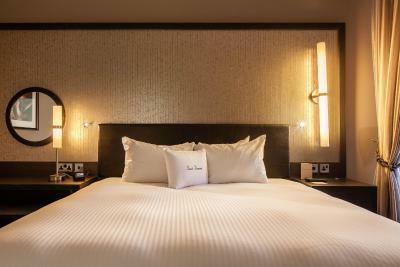 The modern rooms with private bathrooms have luxury Egyptian cotton bedding, hairdryers and tea/coffee-making facilities. 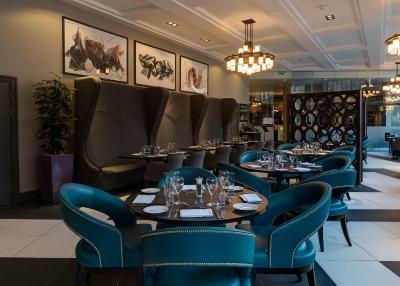 The Monboddo Bar features stylish leather seating and is open until 1 am. 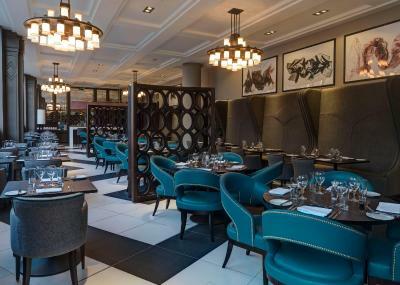 The award-winning Bread Street Brasserie serves modern and classic dishes. The menu includes fresh Scottish beef and fish. 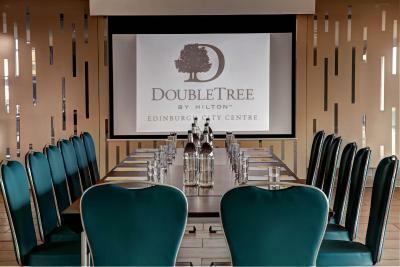 When would you like to stay at Doubletree by Hilton Edinburgh City Centre? 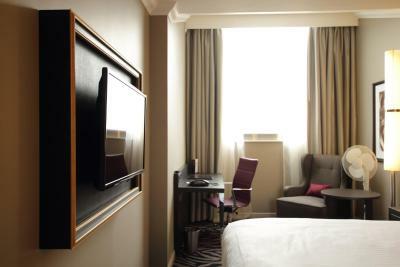 A 37-inch flat-screen TV, a king-size bed and private bathrooms are featured in this room, along with a mini-fridge. Public parking is available at a location nearby (reservation is not possible) and costs GBP 12 per day. 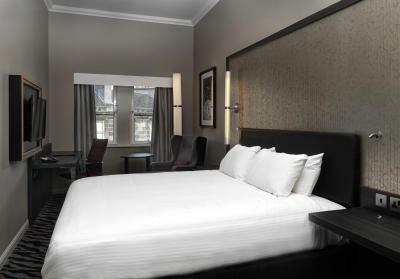 With 2 double beds, this room includes a TV, ironing facilities and tea/coffee making facilities. 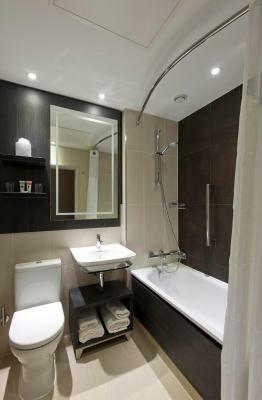 The room can accommodate a maximum of 2 guests. With a 37-inch flat-screen TV, this room offers private bathrooms and a mini-fridge. The room has a mini bar, available at an additional charge. Guests will find bathrobes and slippers, and additional living space in the room. 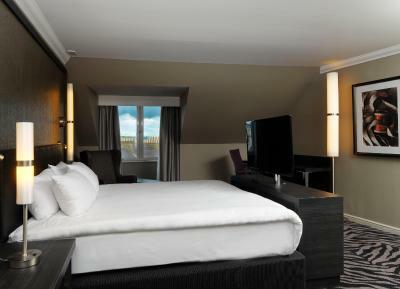 A 37-inch flat-screen TV, king-size bed and private bathrooms are featured in this room, along with a mini-fridge. 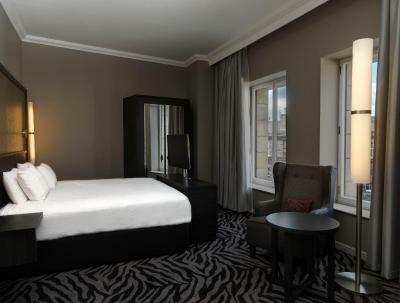 The spacious King Junior Suites offer a bedroom and separate seating area. 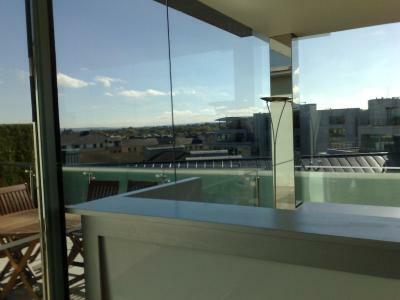 The suites have views of the castle and modern amenities. 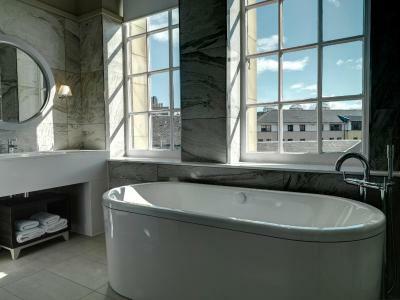 The en-suite contains a separate bath and shower, bathrobes and slippers. 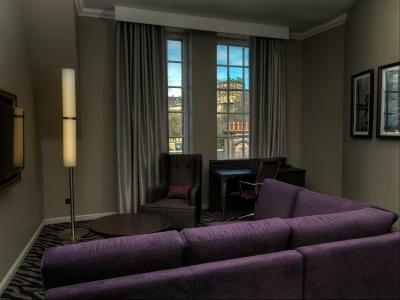 Room amenities include complimentary WiFi, LCD TV, a desk with ergonomic chair, a Sweet Dreams® bed and mini-fridge. 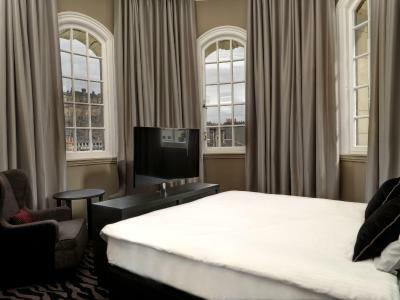 This room offers a view of Edinburgh Castle, 2 double beds, tea/coffee making facilities and a flat-screen TV. Additional amenities include added living space, and bathrobes and slippers. This double room features air conditioning, a mini-fridge and bathrobe. Guests can enjoy additional living space, bathrobes and slippers with this room. 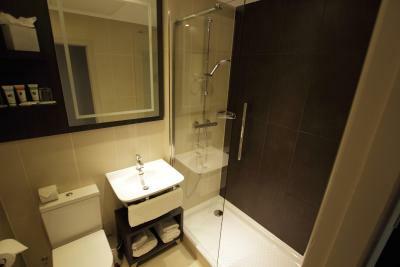 The private bathrooms contain a roll-in shower, lowered hand basin and an alarm system. This room features a work area with a flat-screen TV and tea/coffee making facilities. THE LITTLE THINGS MEAN EVERYTHING. At DoubleTree by Hilton™ hotels, every little thing we do adds up to Create A Rewarding Experience for our guests (CARE). Our hospitality starts with a warm chocolate chip cookie upon arrival. 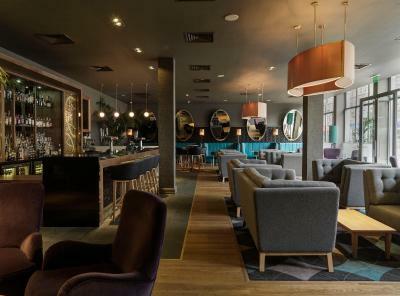 House Rules Doubletree by Hilton Edinburgh City Centre takes special requests – add in the next step! One child under 12 years is charged GBP 25 per night when using existing beds. 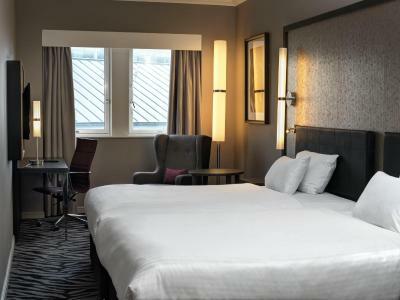 Doubletree by Hilton Edinburgh City Centre accepts these cards and reserves the right to temporarily hold an amount prior to arrival. 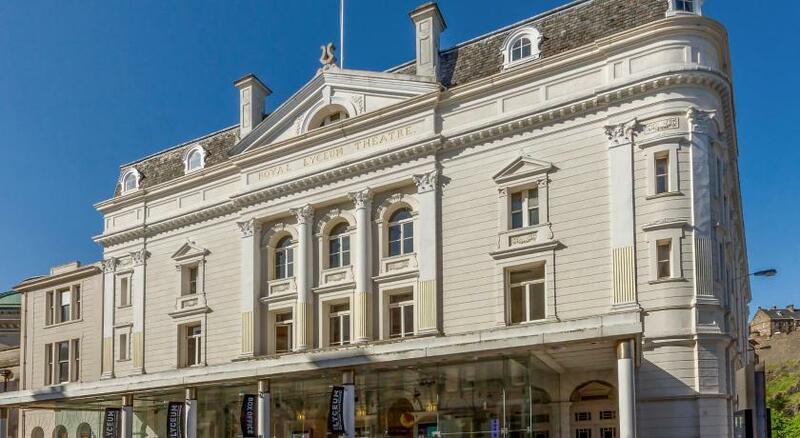 Please note that the Grade A Listed building will be undergoing essential renovation works. 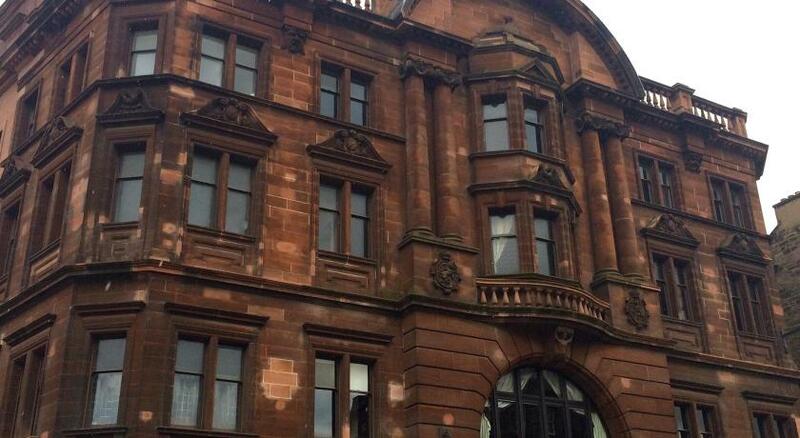 There will be scaffolding covering a section of the hotel to upgrade the windows and fix the sandstone façade. 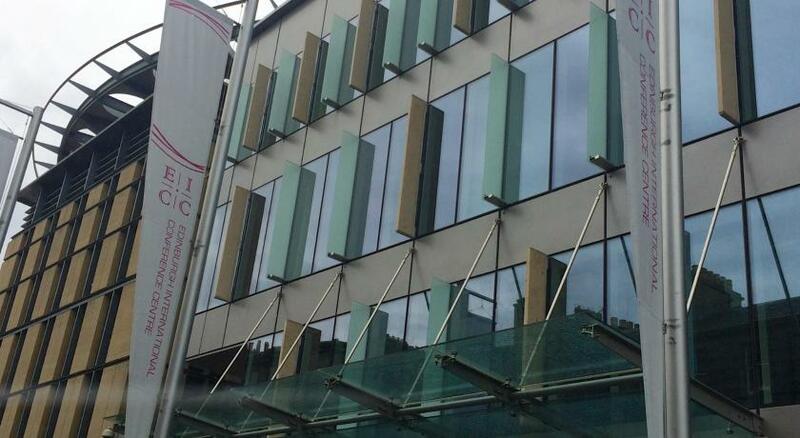 The hotel is fully open during this process with a small portion of the rooms affected during these works. Guests receive a discounted parking rate (as listed in the Policies), however the ticket must be validated by the hotel in order to receive this discounted rate. Staff where so welcoming And helpful we were very happy with our stay. There was an occasional unpleasant smell from the bathroom. We were disappointed not to have the afternoon tea as the times were wrong on the menu!!! Slightly more storage space would have been helpful as we were staying for 3 nights. 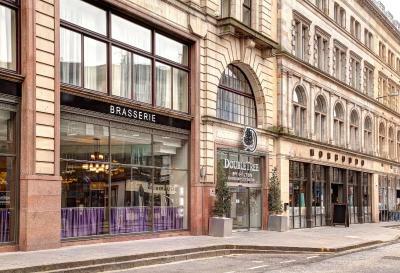 The breakfast was superb and all the staff were friendly and helpful. The view from the room was an added bonus which we weren't expecting. We ate in the restaurant for 2 nights and enjoyed the food. Pillows too soft for me! Bedroom light fittings and shelves were very dusty. Dusty bathroom, especially shelves. Staff were very slow to bring cutlery after they served our food. It took 3 requests before the cutlery arrived. Bar and restaurant staff were constantly distracted by administration problems which meant they werent putting customers first. Breakfast was generally good but some buffet foods were in either in short supply or were not hot. Friendly and efficient checkin and checkout staff. Nice bedroom. Nice bar and lounge to relax in. No Hairdryer in room most top hotels have hairdryer available. The bathroom is a bit dated. Bed was large and comfortable. View of the castle was incredible. Great location. Friendly, helpful staff. Ricardo on reception was very helpful. 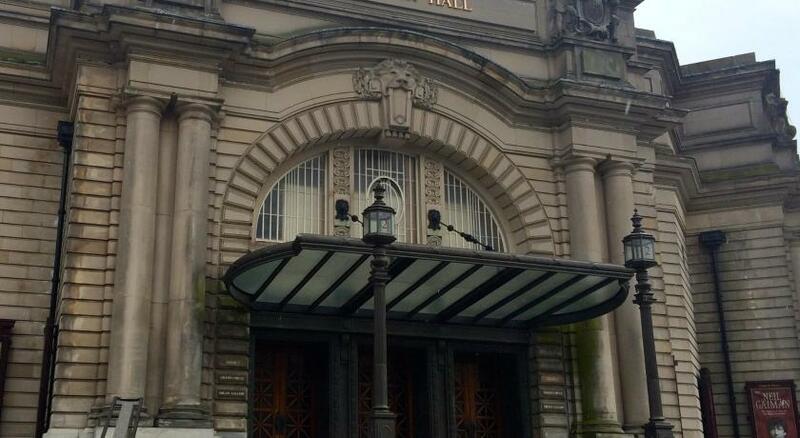 There was a scaffolding around the whole building, which wasn't mentioned somewhere. 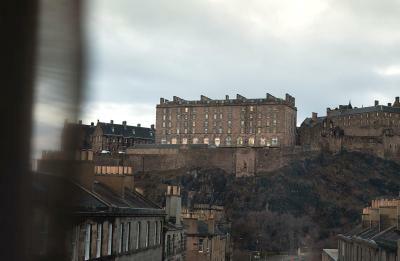 We booked a room with Castle-view, but all we saw was the scaffolding :-( Not to mention, that the room got very dark with the scaffolding in front of the window. But what really annoyed me: Four weeks ahead of our stay, we booked four days. Three weeks before getting there, we needed to cancel two of them. I kindly asked for a cancellation, knowing that we booked without that option. I was hoping for obligingness, a little discount, breakfast voucher, something like that (again, we had to cancel only two days three weeks ahead!). The answer came quickly: A rude one-liner, referring to the T&Cs. So we ended up paying full four days, and stayed for only two of them - thank you for the service, this was my last stay in this hotel. 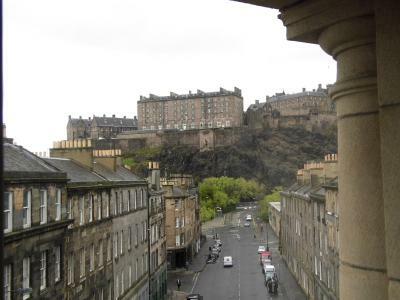 Very good location, close to Edinburgh Castle and Grassmarket square. I thought the food was ok but the service was inconsistent. Found the 'hot' food quite cold. Waited, without success, for fried eggs on the first morning and I gave up waiting. Also, had poor service in the bar including a surly barman who refused to accept that the Pinot Grigio he had poured for my friend (someone who is not a 'complainer') was perfectly fine even though she could not drink it! Room service was very inconsistent also, was left with no shampoo one morning and the room wasn't made over at all on one day! When I asked reception for towels and shampoo... they sent them up and left them on the unmade bed. I train people in customer service and employee engagement and I didn't see a lot of evidence of 'engaged' staff. Location was good and the room itself was good. Too much traffic noise for my taste and the builders on the scaffolding outside woke me earlier than I would have liked. Staff, room, bar, evening meal. It would have been nice to have some vegetarian options from the hot buffet at breakfast...too much pig! 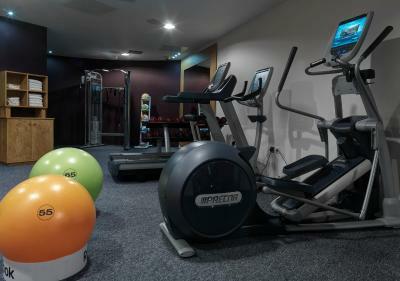 The location was just perfect for our needs, 15 min walk from Haymarket, 20 min from Waverley. Plenty places to eat nearby the hotel. Daily cleaning was cursory. Towels disappeared had to phone reception. Toilet flush mechanism dodgy and broke on last morning. It was okay. Location the best. Staff fine.